Project EverGreen is once again hosting a mower giveaway raffle to support its “Healthy Turf. Healthy Kids.” initiative. This year’s prize will be an Exmark Lazer Z-X series mower. All proceeds will be used to renovate more sports fields and playing surfaces across the U.S. and spread the word about healthier, safer grass surfaces. Raffle tickets cost $10 per ticket or $50 for six tickets. 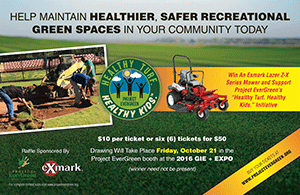 The drawing will take place Oct. 21 in the Project EverGreen booth at the 2016 GIE+EXPO. Participants do not need to be present at the show to win.